The What: New designs for Middle Atlantic’s L5 Series Lecterns will be on display at InfoComm 2015. The Lectern offering has been expanded with new styles, wood finishes, and options to appeal to a range of design aesthetics. 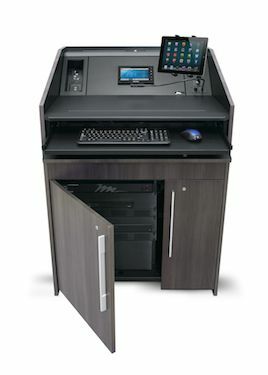 New designs for Middle Atlantic’s L5 Series Lecterns will be on display at InfoComm 2015. The What Else: Suited for higher education and corporate environments, the Lectern incorporates the company’s “frame to furniture” design. This approach complements an integrator’s installation workflow with foundational frames that ship from stock for immediate integration and a custom furniture finishing kit that is manufactured to order and shipped separately to the jobsite.